New for May 2010! The spreadsheet that created the graphic below is now available in our download area, thanks to The Professor! Image rejection can be calculated by the vector subtraction of the mixer's two outputs at the image frequency; achievable errors in amplitude and phase reduce the image rejection. The formula is simple and can be entered into an Excel spreadsheet. The amplitude imbalance gamma is not in dB. The plot below shows the effect. But first, let us comment on the "sign"... rejection as defined by most scholars and other rogues should be a positive number in dB. The above formula yields a positive number. But often you will see results expressed as a negative dB value. It is OK to roll your eyes at such a mistake, but it is considered bad etiquette to slow down a design review because of it! Thanks to Wayne for pointing out our minus sign error in May 2010! 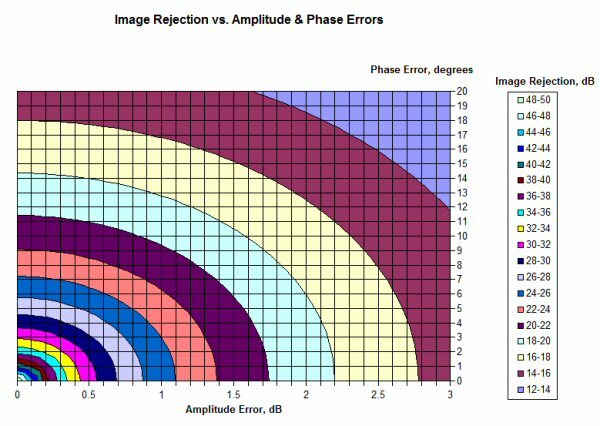 A good goal for an image rejection mixer is 20 dB rejection. Why? because this will keep the noise figure contribution of the image frequency down below 0.1 dB. 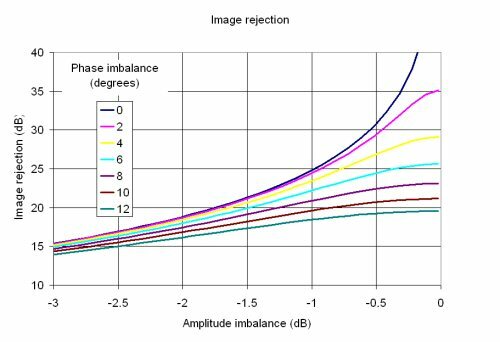 Referring to the figure, you can trade perfect phase balance for 1.7 dB amplitude imbalance and get 20 dB rejection, or perfect amplitude balance for about 11 degrees phase error and still get 20 dB rejection.